Pan-Asian cuisine that is ridiculously vegan friendly. Separate veggie menu is always expanding and they are happy to accommodate special requests. Lots of tofu options, curries and mock duck has recently been added. Wednesday night is vegan night with half price on vegan appetizers. Don’t miss their wall of facebook friends in the entrance. The atmosphere is family style, the restaurant used to be a Village Inn. I’m going there for lunch today. Jealous? No but seriously this place is one of the most friendly to vegan places out there. They often host vegan omaha meetups there and make an entire vegan buffet (including cake!) for all the vegans there. If that’s not vegan friendly I don’t know what is. Also they have a weekly ‘Vegan Appreciation’ night with discounted vegan appetizers and soups with your food. Personally my favorite is the lucky seven tofu, which is breaded/fried eggplant with a spicy peanut sauce with triangles of tofu. The food here is VERY good! Very vegan friendly. My boyfriend even got a mock duck dish! It is kind of pricy… About $35 for two people is what we spent. Totally worth it for the food, atmosphere, and great staff though! My favorite dish here is the ‘lucky 7’ and my husband’s is the ‘volcano tofu’. Add teriyaki mushrooms and a vegan eggroll as an appetizer and you’re set! I wanted a place to go on my birthday where my folks who eat meat would be happy and me and my husband who don’t, would also be happy. This place turned out to be perfect! The atmosphere is very quiet, but nice. And when it comes to the food, it doesn’t get any better than a regular menu, a veggie/vegan menu, and a gluten free menu! My sister comes to town next week and she is gluten free, so we plan on making this one of our dinners while she’s here. You don’t just have 5 or 7 vegan options, you have a whole page. 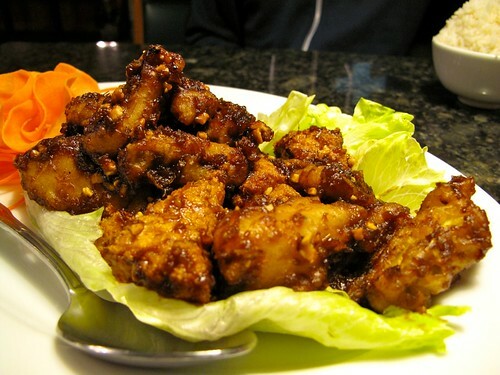 One thing I missed when we went vegan was general chicken at Chinese restaurants, their general mock duck is awesome. We had 3 appetizers off the veggie menu, they were all delicious, and the curry noodle soup was amazing. Can’t wait ’til my sister gets here! My non-vegan family was discussing where to go out to eat and they decided on Chinese. Then they turn to me and say “oh, you can’t eat that can you?” Not wanting to be complicated I say, “oh, yeah, I’ll be fine”. Not knowing which restaurant we were going to, I kinda start to panic. They chose Crystal Jade. When we sat down and the menu said “Ask for our vegan menu” I was sooooooo excited! They legit had a FULL vegan menu. It was so good, especially the Mock (?) “Duck”. To be able to order a regular meal like the rest of my fam was really nice.